I recently got some requests for smoky eyes that weren't the traditional grey, brown, or black. Instead of just doing the typical colored smoky look by replacing the black/grey/brown with a green, blue, violet, etc, I wanted to shake it up a bit and give you a fun option that has maximum impact and takes about 5 minutes to do, and can be re-created with just black shadow and any sparkly shadow or pigment. 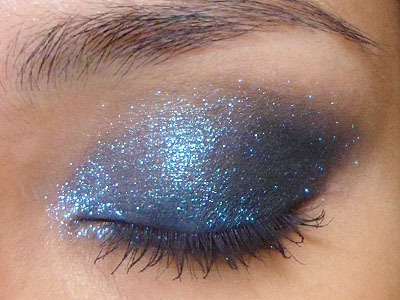 If you've ever looked at sparkly, dramatic shadows like MAC Sketch, NARS Night shadows, etc but wished the sparkles were visible in real life, this is a way to get that effect. Step 1: Apply a black base and blend/fade up past your socket line. Extend outwards slightly past the outer corners into a short wing as well. This is important because matte, black shadows can go on a bit uneven and patchy otherwise. Step 2: Apply the matte black shadow alongh the lash line, thickening and angling upwards as you reach the outer corners, until you end right at the socket line. Then run the remainder along the lower lash line from outside fading in. Run the remainder along the lower lash line from inside out. Step 4: Finish with black mascara. Because of the sparkly colored shadow "floating" over the very dark base, you transform the shadow into an extremely unique shade and texture that you can't replicate using a single product. The best thing is you can swop out the sparkle to pink, purple, gold, blue, whatever you like! Thanks Constanze! I think I was a bit surprised that the effect turned out so nice. I wasn't expecting the sparkles to show up so well but somehow they really pop over the black base.